Happy Wednesday everyone it's time for our Monthly Design Team dare at Your Next Stamp. This month the team was challenged to use our new gumdrops on our projects! I'm using the new Waddles Fortune Teller set and dies and both sets of the new gumdrops! I created a soft background on a piece of Bristol paper using some Distress Oxide Inks and then I adhered the panel to an A2 size card base. I stamped the sentiment in the upper corner in Black Olive Ink. Then I stamped the images onto some X-Press it blending card stock with Black Olive ink and colored it in with Copics. After I colored the images in I used the coordinating dies to cut them out. Then I adhered the images to the lower corner with some foam adhesive. I used the Hearts and Dots Gumdrops around the image and then I used one of the Frosted Fun Gumdrops in the center of the crystal ball. So cute!!! I added some Wink of Stella in Gold and Pink on the feather area of the hat. 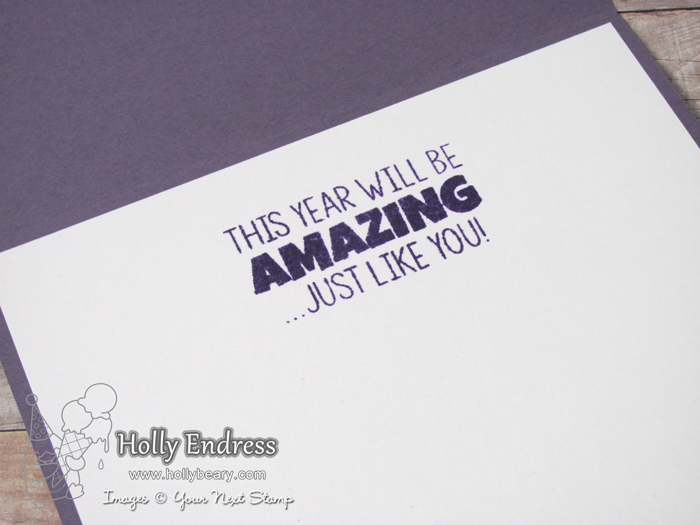 I also stamped a sentiment from the same set on the inside of the card in Purple Passion ink. 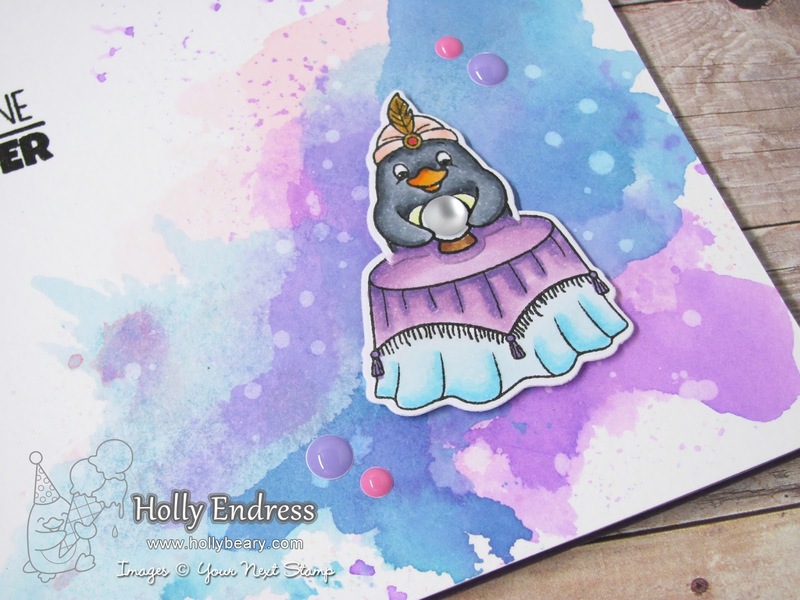 Head over to the YNS Blog and check out what the other Design Team members created for the dare and be sure to leave a comment while you are there for a chance to win a stamp set of your choice. Super cute! 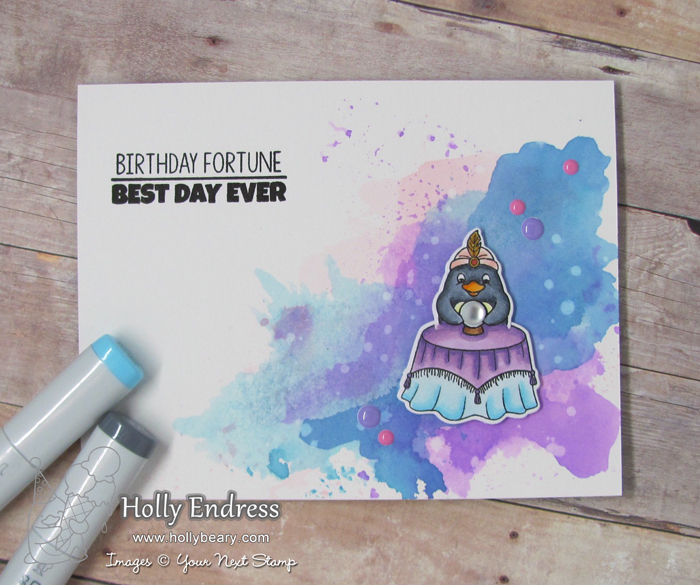 Love the watercolored background!